On the way to the Old Gold Mines village. Changing the plan: there was a brush fire in the area of this hike, and no one is allowed to go hiking right now. We’re changing the hike, and will update the website ASAP. Holiday hike! It’s the Tomb-Sweeping Festival holiday weekend, and we might get stuck in traffic at some point on the way to or from the hike. We recommend you don’t make fixed plans for the evening, just in case. Old favourite! 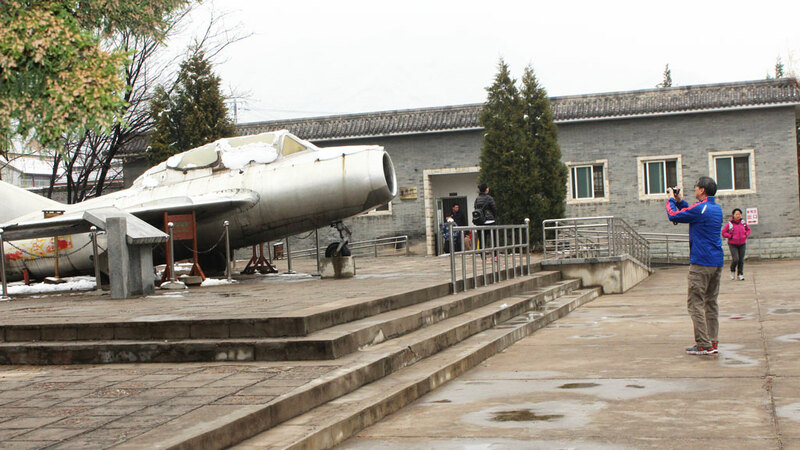 The rural districts and counties of Beijing contain many interesting places that you could drive right past without noticing. One of the places we’ll visit on this trip is even harder to spot—a system of tunnels built under a village in the 1940’s for use as part of a guerilla warfare strategy. 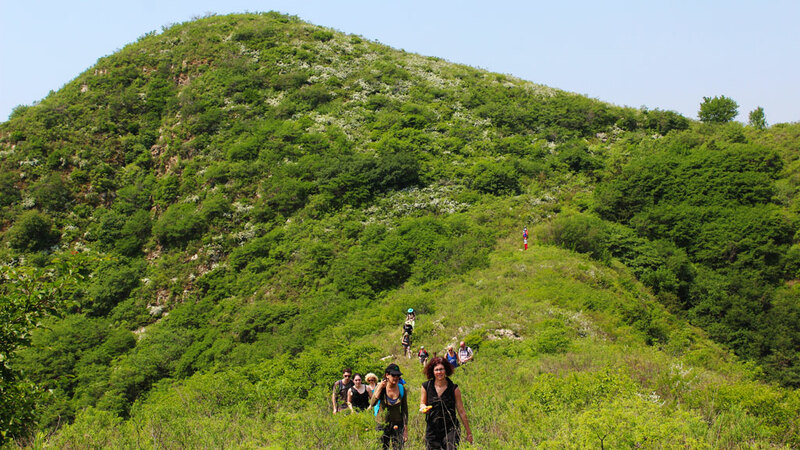 Shunyi Pinnacle Plaza pickup available: We’ll stop by the Starbucks at Pinnacle Plaza on the way out to the hike and on the way back. If you’d like to be picked up there, please write us a note when you make your booking. 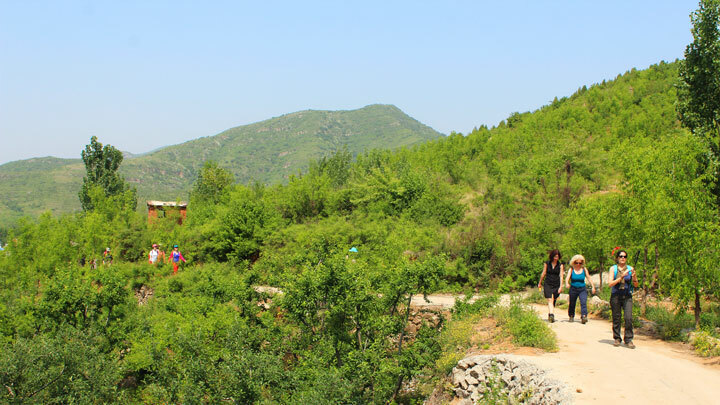 We’ll stop for a 30–40 minute look about the war tunnels on the way to the hike, a 6km walk through the hills of Pinggu District. In Chinese territory occupied by Japanese forces it was common practice for local inhabitants to be conscripted to work for the Japanese. As well as searching villages for people who could be forced to work, grain and other supplies were also found and taken away. 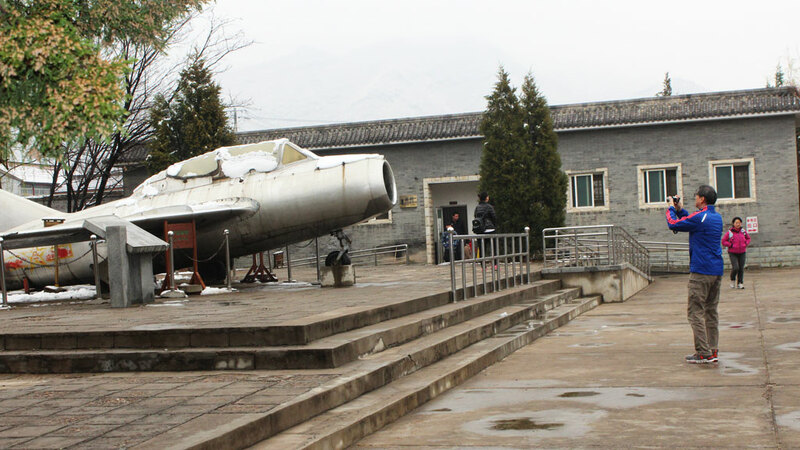 In the autumn of 1938, Communist party soldiers came to the village and began to organise the villagers – arming them, and training them in guerilla warfare. 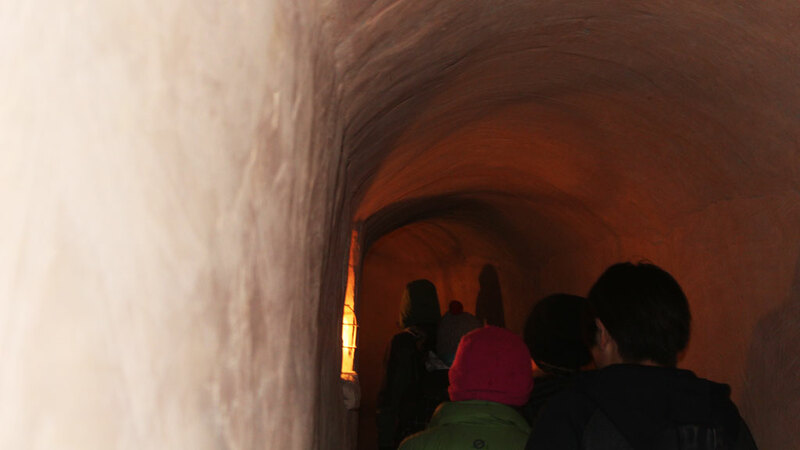 The first phase of tunnel digging began as a way to hide stores of grain or rice, and sometimes people. As the holes became larger, the villagers started to make tunnels between holes, and eventually the tunnel system grew to a length of 11km. The tunnels began as simple holes in the ground, and were extended over the course of seven years to form a full tunnel system that featured meeting rooms, gas traps, and storage space for water, food, and munitions. 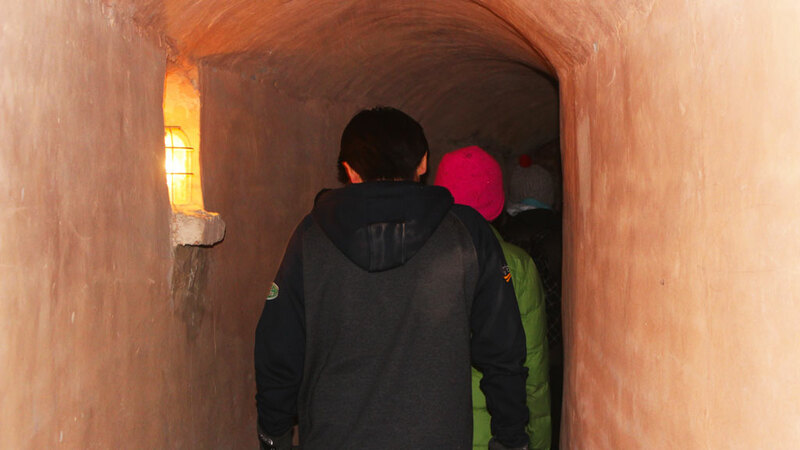 The tunnels joined many of the houses in the village, and some of the hidden entrances and exits – underneath beds, below grinding stones, inside animal pens – have been restored for visitors to use. At the site of the tunnels, we’ll first visit the Exhibition Hall for an introduction to the historical background of the tunnels. Then we’ll head underground to explore the restored section, a 650 metre stretch of tunnels that has been enlarged and had lights added. In the rolling hills nearby the tunnels there are several old trails between villages. 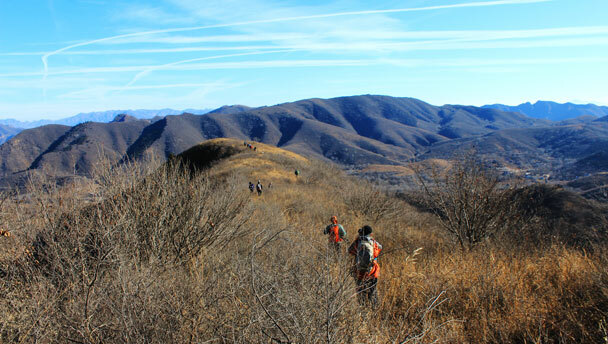 We’ll follow the trail that finishes at ‘Gold Mountain’ Village, a small settlement named for the wildcat gold mines in the surrounding hills. The small mines have been closed for quite some time now, but back when we first started doing this hike they were still in action. Our relatively relaxed 6km hike starts at the entrance of a small village, and we’ll take a short stroll through its streets before following a field trail that leads out into the hills. The trail leads up and over a ridgeline, and this is the only real climb of the whole hike. Because there’s a lack of water in the area, the hills above the villages are not actively farmed, and all that grows on them are thorn trees and tall, wavy grass. The grass is nice to walk through, particularly in the spots where it has grown hip-high; the thorns not so much! We’ll make our way down the other side of the ridge and head for a mostly-deserted village, where we’ll stop to eat our lunch. Back in 2004, there were only around 40 people living in the village. Since then, the population has dropped further – young people would move out, looking for work in the city, leaving only the elderly. There were plans to build villas and an equestrian facility by the village, but in the end only a few villas were built. After our lunch break we’ll head on through the hills, walking through valleys and meadows on the way up and over the ridge to ‘Gold Mountain’ Village. Our bus will meet us there, and then we’ll be on our way back to Beijing after a nice day out in the countryside. It’s quite a short hike, and the trail is a little overgrown. There’s a fairly steep climb on the first hill. Hike is suitable for kids aged 7 and up. 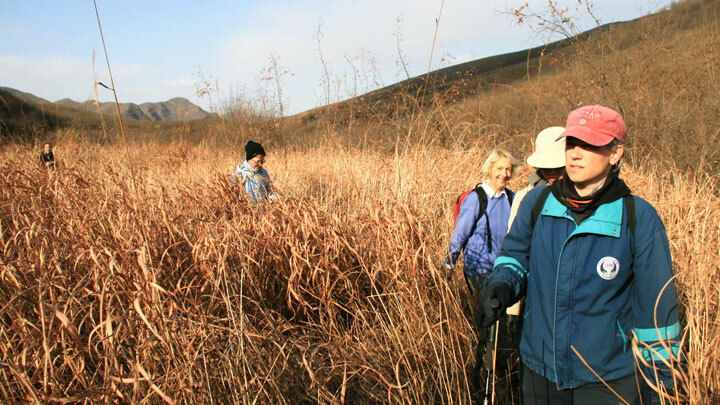 For this Wednesday trip we paid a visit to the War Tunnels Museum on the outskirts of Shunyi District before walking a nice hillside trail in Pinggu District, ending up at the Lost Village - click through to see photos from the hiking part of the day.